APOLEON BONAPARTE, in addition to his extensive influence on western history, has been an imposing presence in the history of film. As early as 1897, the Lumière Brothers produced the first recorded film depicting an incident from the life of Napoleon, Entrevue de Napoléon et du Pape (Interview between Napoleon and the Pope), a short, one-minute historical tableau directed by Georges Hatot. Since then, more than 200 actors have played the part of Napoleon in film and on television. As the French continued to produce silent short films illustrating various scenes from Napoleon's eventful life as the Nineteenth Century came to a close and the Twentieth Century began, the first non-French film devoted to Napoleon, Napoleone sull'isola di Elba (Napoleon on the Island of Elba), was produced in Italy in 1907—though the United States may make a somewhat slim claim to the first non-French Napoleonic film with American Mutoscope & Biograph's The Escaped Lunatic (1904), where the unbalanced title character is dressed as Napoleon. Soon after, the English became a member of the growing list of nations producing Napoleonic films in 1908, with Napoleon and the English Sailor, a film based on a supposedly true incident in 1809 where Napoleon released an English prisoner anxious to return home to his widowed mother. As silent films matured, full-length feature films with Napoleon as a character, often based on popular novels and plays, began to show up at the local theaters with increasing frequency. Brigadier Gerard (England, 1915) and The Fighting Eagle (1927) both based on stories and a play by Sir Arthur Conan Doyle, Scaramouche (1923), based on the novel by Rafael Sabatini, Madame Sans-Gêne (1924), based on the play by Émile Moreau and Victorien Sardou, and Glorious Betsy (1928), a partial talkie based on the play by Rida Johnson Young, being just a few of the more significant examples. 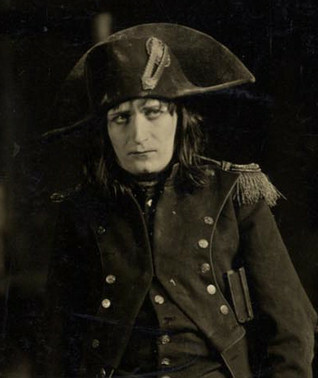 But by far, the high point of Napoleonic films made during the silent era was undoubtedly Abel Gance's epic French production of Napoléon, starring Albert Dieudonné, released in 1927. Telling the story of Napoleon's early years from the time he was a picked-upon student attending a military academy at Brienne-le-Château (child actor Vladimir Roudenko) and proceeding up to his days as the intense, driven, heroic young general assuming command in the first Italian Campaign in 1796 (Dieudonné), Napoléon was originally intended by director Abel Gance to be the first installment of a six-part epic chronicling Napoleon's entire life. Unfortunately, Gance was never able to raise the money necessary to complete his projected series of films—though he did put considerable effort into re-editing his six and a half hour masterpiece for various re-issues over the years, and did manage to return to his subject in the 1960 film, The Battle of Austerlitz aka Austerlitz. 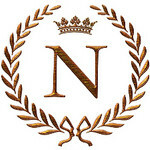 However, other than the excellent restorations of Napoléon put together by film historian Kevin Brownlow, the only remnant of Gance's original hopes for a multi-part epic of Napoleon's life is the 1929 German silent film, Napoleon auf St. Helena (Napoleon at St. Helena), which is based on a scenario that Gance was eventually compelled to sell to director Lupu Pick, and was to be the last in his projected series of pictures. The silent film era came to a sudden close with the widespread introduction of sound pictures in 1928 and 1929, and Napoleon remained a popular character as audiences thrilled to the novelty of talking pictures. Glorious Betsy (1928), mentioned above, was only the second partial talkie feature film released by Warner Brothers after The Jazz Singer (1927), and it was quickly followed by the short talking picture, Napoleon's Barber, released by the Fox Film Corporation later that year. The first full-length talking picture with Napoleon as a character was Seven Faces, released by Fox in 1929. Oddly enough, two of the earliest sound films to feature Napoleon, albeit in rather small parts, were musicals. Devil-May-Care (1929) had popular movie idol Ramon Novarro playing the romantic lead, with William Humphrey putting in his seventh film appearance as Napoleon, and in Der Kongreß tanzt (Germany, 1931), concerning the various romantic goings on at the Congress of Vienna in 1815, Ernst Stahl-Nachbaur was briefly seen in an uncredited cameo as the Emperor. From brief but significant roles in such pictures as The Count of Monte Cristo (1934), Hearts Divided (1936), Anthony Adverse (1936), and Napoleon ist an allem Schuld (Napoleon is to Blame for Everything) (Germany, 1938), to more substantial biopics such as Conquest (1937) and A Royal Divorce (England, 1938), Napoleon continued to maintain an active presence on film as the 1930s progressed. Hollywood and world cinema had always been somewhat ambivalent towards the Emperor, portraying him at various times as a hero, a despot, a lover, and even occasionally as a figure of fun, but as world events led up to the Second World War, the cinematic portrayal of Napoleon began to take on more ominous overtones. Adolf Hitler had been appointed Chancellor of Germany in 1933, and his anti-Semitic rhetoric and expansionist aims were viewed with considerable alarm in certain parts of the world. In one of the earliest salvos in Hollywood's propaganda war against the Nazis, 20th Century Pictures released The House of Rothschild in 1934. In The House of Rothschild, we catch only a glimpse of Napoleon (Louis Shapiro) on horseback behind a superimposed title card that updates us on the progress of his march through Europe, but his influence is heavily felt through a major portion of the picture. Although Napoleon is not depicted as being responsible for the anti-Semitism that plagues the Rothschild family of bankers in the film, he stands in for Hitler as the Rothschilds provide the financial backing for the forces necessary to halt the Emperor's spreading despotism and secure freedom for the oppressed peoples of Europe. As the world inevitably descended into war, both sides used Napoleon to symbolize evil in their propaganda endeavors. In The Young Mr. Pitt (England, 1942), Napoleon (a young Herbert Lom, in his first English-language film) is portrayed as a glowering sociopath, anxious to engulf Europe in pursuit of his personal ambition—his chief opposition coming from the heroic, iron-willed English Prime Minister, Pitt the Younger (Robert Donat), despite the rumblings of a contentious Parliament. The parallels with Adolf Hitler and Winston Churchill could hardly have been clearer. In 1944, German forces were still occupying Soviet soil, and the Russians hoped to keep up morale and encourage patriotic resistance with the 1944 release of Kutuzov, aka 1812. 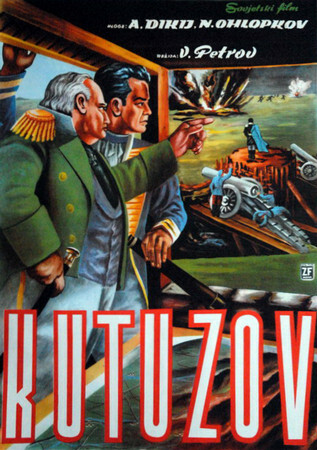 Utilizing men and resources that might better have been devoted to the war effort, Kutuzov is the inspiring story of General Kutuzov's (Aleksei Dikij) successful efforts to stymie Napoleon's (Semyon Mezhinsky) invasion of Russia. Although the propaganda is a bit more subtle than England's The Young Mr. Pitt, it isn't much of a stretch to equate the French attack of 1812 with the invasion of the German army in this wartime version of European history. By 1945, the fortunes of war had turned, and the Allies were encroaching on German territory from all sides. Now it was Nazi Minister of Propaganda Joseph Goebbels' turn to cast Napoleon as a villain in UFA's production of Kolberg, which told the story of the heroic, though ultimately futile, efforts by the peasants of Kolberg to resist Napoleon's (Charles Schauten) 1807 advance into Prussia. Seen in retrospect as a monumental waste of scarce wartime resources and manpower, Kolberg was Goebbels' ham-fisted attempt to inspire the beleaguered German populace to make one last stand for the Fatherland. Despite having meddled with the script, Goebbels was unhappy with director Veit Harlan's finished picture, and had it heavily edited to cut footage depicting the horrors of war. The result is a sometimes incoherent narrative that lacked any actual propaganda value, since most German theaters were closed by the time the film was released. 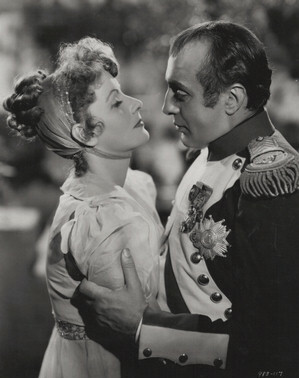 Meanwhile, in occupied France, Napoleon was portrayed in a more benign light in such pictures as Madame Sans-Gêne (1941), a comedy with Albert Dieudonné reprising his celebrated role as Napoleon, and Le destin fabuleux de Désirée Clary aka Mlle. Desiree (1942), where a romantic Napoleon was portrayed in his younger years by Jean-Louis Barrault, and in his later years by the film's writer and director, Sacha Guitry. 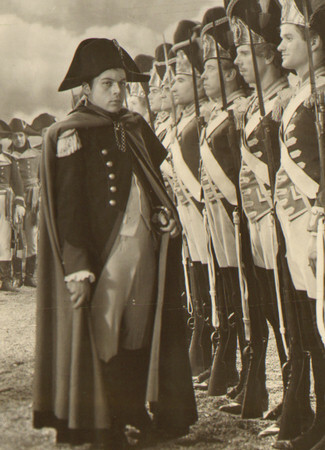 In Argentina, which remained neutral until the last stages of the war, Napoleon was also portrayed more favorably in their 1945 remake of Madame Sans-Gêne, with Eduardo Cuitiño as Napoleon. There weren’t many films made featuring Napoleon in the years immediately following World War II, a notable exception being director Sacha Guitry’s Le diable boiteux (The Lame Devil) (France, 1948), a biopic of the notoriously Machiavellian French diplomat, Talleyrand. Le diable boiteux gives the audience an overview of Talleyrand’s diplomatic career, from his sometimes subversive service to Napoleon (Émile Drain, who had made something of a career out of playing Napoleon, though he was perhaps getting a bit too old for the part) up through the restoration of the Bourbons under Louis XVIII, followed by Charles X and Louis-Philippe. Although the film is quite stagey, Guitry does a fine job in the title role. Two developments in the 1950s were to provide additional opportunities for audiences to regain their familiarity with the Emperor. The first was an explosion in the availability and popularity of television, and the second was in reaction to that development—the introduction of movies produced in Cinerama and other widescreen processes. Of course, Napoleon had previously been portrayed in both venues, with Abel Gance’s three-projector widescreen ending to Napoléon having been presented to the public in 1927, and the BBC having telecast an adaptation of George Bernard Shaw’s play, The Man of Destiny, in 1939, but it was in the early 1950s that television and widescreen movies first began to have a major impact on audiences. 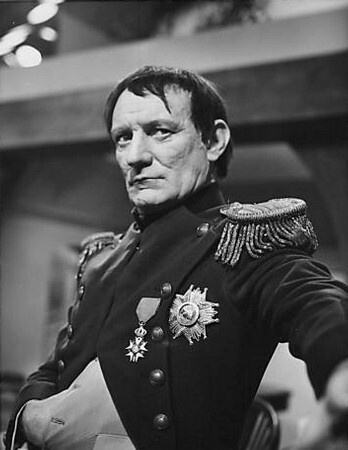 During the Golden Age of Television, Napoleon showed up on such anthology series as Omnibus, in a segment entitled The Love Story of Napoleon aka Napoleon's Letters (1953), Schlitz Playhouse, in an episode recounting Conan Doyle’s tale, How the Brigadier Won His Medals (1954), You Are There, in an episode depicting The Abdication of Napoleon (1953) and another reenacting Napoleon’s Return From Elba (1955), and ITV Television Playhouse, in a new production of Shaw’s Man of Destiny (England, 1955). In the 1960s, Napoleon continued to show up in such made-for-TV productions as Madame Sans-Gêne, with two versions telecast in West Germany in 1960 and 1968, and yet another version in France in 1963, Eagle in a Cage, presented as a Hallmark Hall of Fame episode in 1965, and Marie Waleska, broadcast in France in 1969, as well as putting in an occasional guest appearance on episodes of such TV series as Doctor Who (England, 1964), The Time Tunnel (1966), I Dream of Jeannie (1967), and Bewitched (1968). As the Hollywood moguls watched their audience being drained away by the novelty of television, they reacted by devising a number of hopefully audience-pleasing gimmicks for their movies. One of the most successful was the 1953 introduction of a widescreen format for the presentation of movies in theaters. The almost overwhelming grandeur of widescreen practically cried out for colorful and sumptuous historical epics, and Hollywood didn’t hesitate to meet this newly discovered need. Desirée, released by Twentieth Century Fox in 1954, was an early example of the widescreen historical epic. Adapted from Annemarie Selinko’s novel, the film told the story of Napleon’s (Marlon Brando) early romance with his sister-in-law, Desiree Clary (Jean Simmons), and their subsequent loves and careers up until Napoleon’s final downfall. Although there were no battle scenes, the colorful costumes, lavish sets, and high-profile stars gave the public a tempting alternative to the small black and white television screen back in their living rooms. Subsequent widescreen epics included such pictures as The Purple Mask (1955), with Tony Curtis as a wannabe Scarlet Pimpernel working against Robert Cornthwaite’s Napoleon, King Vidor’s War and Peace (1956), with Herbert Lom redefining his interpretation of the Emperor, and Abel Gance’s The Battle of Austerlitz aka Austerlitz (France, et al, 1960), a belated follow-up to his earlier silent-era masterpiece, with Pierre Mondy giving an excellent impersonation of Napoleon. Other notable films featuring Napoleon that were released during this time were Sea Devils (1953), with Gérard Oury as a somewhat anachronistic Emperor, Napoléon (Italy/France, 1955), with Daniel Gélin portraying Napoleon from a young artillery officer to First Consul, Raymond Pellegrin as the Emperor, and director Sacha Guitry reprising his role as Talleyrand, Madame aka Madame Sans-Gêne (Italy/France/Spain 1961), with Julien Bertheau as Napoleon and Sophia Loren in the title role, Venere imperiale (Imperial Venus) (Italy/France, 1963), the story of Napoleon’s willful sister, Pauline (Gina Lollobrigida), with Raymond Pellegrin again appearing as Napoleon, and Marysia i Napoleon (Maria and Napoleon) (Poland, 1966), with Beata Tyszkiewicz as Marie Walewska and Gustaw Holoubek as Napoleon. 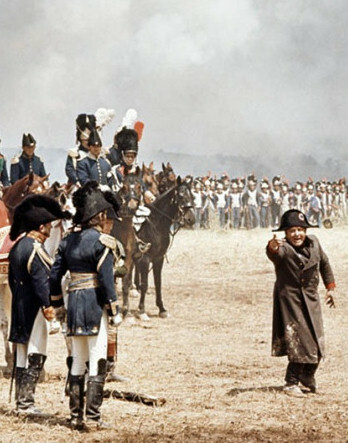 One of the finest as well as one of the most ambitious films set during the Napoleonic era was Mosfilm’s Voyna i mir (War and Peace), released in four parts from 1965 to 1967. Directed by Sergei Bondarchuk, who also played Pierre Bezukhov, this sprawling adaptation of Tolstoy’s epic novel took seven years to film and employed a reported 120,000 extras. Although his screen time was limited, Vladislav Strzhelchik made for an imposing and memorable Napoleon. 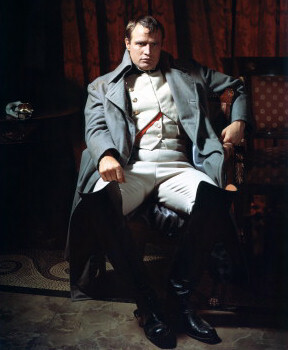 Director Bondarchuk brought Napoleon back to the screen once more, in the person of actor Rod Steiger, for 1970’s Waterloo (Italy/Soviet Union). Again using thousands of extras for the battle scenes, Waterloo is a mostly faithful account of Napoleon’s final battle. The movie tanked at the box office, but is a particular favorite among history buffs and armchair generals. Perhaps appropriately, the next big-screen film to feature Napoleon was Eagle in a Cage (United States/England, 1972), purporting to tell the story of Napoleon’s exile to the small island of St. Helena following his defeat at Waterloo. With a slightly too young, and much too thin, Kenneth Haigh in the role of Napoleon, this somewhat distasteful film is unfortunately a bit too loose with the facts regarding the Emperor’s final years. Napoleon was played for laughs at the theater throughout much of the 1970s and 1980s. The Adventures of Gerard (England/Switzerland, 1970) was a somewhat misguided retelling of Conan Doyle’s Brigadier Gerard stories, with an amusing Eli Wallach hamming it up as the Emperor. Love and Death (France/United States, 1975) was Woody Allen’s answer to War and Peace, with his character Boris Grushenko conspiring with Diane Keaton’s Sonja to assassinate James Tolkan’s Napoleon. Le avventure e gli amori di Scaramouche (The Loves and Times of Scaramouche) (Italy/West Germany/Yugoslavia, 1976) had an inept and vainglorious Napoleon (Aldo Maccione) being cuckolded by the title character, who stumbled upon the comely Josephine (Ursula Andress) while she was bathing in a pond. Time Bandits (England, 1981) saw time traveling dwarfs stopping for a brief visit with Ian Holm’s easily amused Napoleon. And who could forget the spectacle of Napoleon (Terry Camilleri) enjoying a day at the water park, pigging out on ice cream, and then getting ditched at a bowling alley in 1989’s Bill & Ted’s Excellent Adventure? During this same period Napoleon fared a bit better on TV, with such serious entries as the BBC’s War & Peace (England, 1972), an expansive, seventeen-episode version of Tolstoy’s novel, with David Swift as Napoleon, Napoleon and Love (England, 1974), a nine-episode series from Thames Television giving an inside look at Napoleon’s (Ian Holm) love life, and Napoleon and Josephine: A Love Story (1987), a three-part mini-series broadcast on ABC, starring Armand Assante as Napoleon and Jacqueline Bisset as Josephine. The 1990s saw a number of European television projects featuring Napoleon, while Ron Cook took the role in a couple of episodes of the made-for-TV programs based on the Sharpe novels by Bernard Cornwell, Sharpe’s Honour (England, 1994) and Sharpe’s Waterloo (England, 1997). 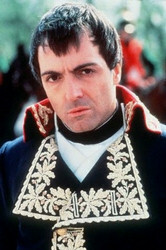 Ron Cook reprised the role of the Emperor in Quills (2000), a film about the confinement of the Marquis de Sade. 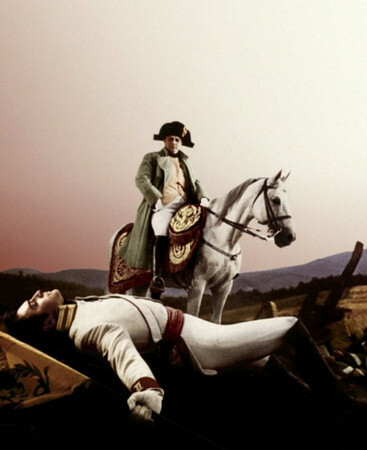 Napoleon continues to be popular in film and television well into the 21st Century. Verne Troyer played a ludicrous Napoleon in several episodes of the farcical TV program, Jack of All Trades (2001), and Ian Holm again played the role in the gentle comedy, The Emperor’s New Clothes (Italy/England/Germany, 2001). Alex Norton had a few brief but commanding scenes as Napoleon in the 2002 remake of The Count of Monte Cristo (England/United States/Ireland), Christian Clavier gave a somewhat tepid performance in the 2002 international TV mini-series Napoléon, Philippe Torreton was a surprisingly effective Napoleon in 2003’s Monsieur N. (France/England), an engaging speculation regarding Napoleon’s exile on St. Helena, Daniel Auteuil played a charismatic, though ultimately untrustworthy Napoleon during his first exile on the island of Elba in N (Io e Napoleone) aka Napoleon and Me (Italy/Spain/France, 2006), and Tom Burke played the ambitious young Bonaparte at Toulon in the Napoleon episode of the BBC’s Heroes and Villains aka Warriors series in 2007. According to media reports, Napoleon will continue to be a presence at the cinema as the new decade progresses. There are reportedly two movies in development that will re-tell the story of Napoleon and the young Betsy Balcombe on the island of St. Helena, and there is talk of an attempt to bring Conan Doyle's Brigadier Gerard stories to a modern movie-going audience, with the Emperor playing a prominent role. But should none of these projects ever come to fruition, if the history of cinema tells us anything, it tells us that Napoleon will return. For while the Emperor may have died nearly alone and friendless in exile, his screen presence continues to fascinate audiences nearly two hundred years later. his filmography lists only those films and TV shows where Napoleon actually appears, however briefly or fancifully. Please click on title links to go to a page devoted to each film or program listed. The story synopses abound with spoilers, so please consider this fair warning. You are visitor number since August 2, 2010. © 2010 by Clark J. Holloway.